Heinrich M. Epp: minister and farmer; born 9 February 1904 in Fischau, Molotschna Colony, South Russia to Martin H. Epp (1860-1912) and Susanna (Rempel) Epp (1873-1910). He was the tenth child of a family of fifteen. He lost his mother at age 6 and his father at 8 and was adopted by his uncle Jakob Epp of Rosenort. He married Anna Enns (24 October 1902, Talma, Terek Settlement - 16 December 1958, Chilliwack, British Columbia, Canada) on 11 May 1924 in Suvorovka. She was the daughter of Elder Franz F. Enns (1871-1940) and Anna (Duerksen) Enns (1874-1938). 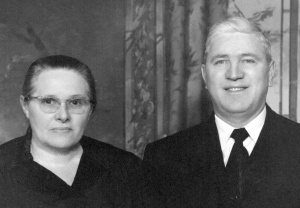 Heinrich and Anna had eight sons and five daughters: Henry, Bruno, Frank, Anna, Menno, Martin, George, Susan, Lydia, Linda, Alvin, Viola and Rudie. Heinrich died very suddenly of a stroke on 13 April 1958 in Chilliwack, BC, and Anna died of a brain tumor later that same year. Both are buried in Abbotsford. In Rosenort Heinrich received his elementary education before going on to high school in Ohrlof and Lindenau, and began his teacher's training in Halbstadt, which was interrupted by unrest in the country. He was baptized at age 19 on 27 May 1923 in the Nikolaifelder Mennonite congregation by Elder Franz F. Enns. After their marriage in 1924 the Epps immigrated to Canada. After two weeks in Drake, Saskatchewan, they lived in Winkler, Manitoba for several years before settling on a farm in Lena, Manitoba in 1927. Here he became active in the Whitewater Mennonite Church for the next 16 years, where he joined his father-in-law, Elder F. F. Enns, in serving, being ordained to the ministry by him on 4 August 1929. In 1945, upon an invitation from the West Abbotsford Mennonite Church, the Epps moved to Abbotsford to a 57-acre dairy and berry farm and to serve, unsalaried, in the church. He soon became the leading minister in an active ministerial of several lay ministers and on 2 May 1948 was ordained by Elder J. B. Wiens as the first elder of West Abbotsford Mennonite Church. As leading minister at West Abbotsford, Heinrich was both congregational chairman as well as leader of the Vorstand, the ministerial leadership team. An astute leader, he saw the needs, proposed well-thought-out solutions, mustered leadership approval and presented motions for congregational support. When his congregation, at one point, discussed the need for a burial place of their own, it was he who suggested a cemetery for use by all area Mennonites. Under his direction, Hazelwood cemetery was established. He was evangelically minded and had a burden for the lost and for the spiritual well-being of his congregation, his community and for the conference. He was the first to introduce evangelistic services in his church and to start "deeper life" services in the provincial conference. He stressed personal salvation and holy living as the criteria for church membership. His motto of "Holy to the Lord" (Heilig dem Herrn-- Exodus 28:36) encapsulated his fourfold vision for the church: a vision of a holy church, serving the Lord, faithful to Anabaptist principles, spiritually disciplined; a vision for the community-- Mennonite settlers and immigrants as well as the surrounding non-Mennonite people; a vision of congregational programs of Bible study, education, music ministry, visitation and personal work, and evangelistic services; and a vision for the calling of laborers who were theologically educated, supported by the church, and were actively serving. From 1949 to 1952 he served as chairperson of the Conference of the United Mennonite Churches of BC. He also served as chairperson of the Provincial Mennonite Relief Committee of British Columbia, and served on the Canadian Mennonite Board of Colonization. As conference chairperson Epp tried to influence the conference to place more of an emphasis on preaching repentance, conversion, and holy living. This emphasis was met with some resistance by those who were critical of the emotional aspects of evangelism and the perceived legalism of those striving to hold each other accountable in matters of holy living. The two theological streams in the conference were not able to maintain an attitude of mutual respect, leading Epp and the West Abbotsford congregation to withdraw from the provincial conference on 28 December 1953. The congregation rejoined the provincial conference in 1957. During his ministry, West Abbotsford saw the church grow from 145 members to 340. It was a period of rapid expansion and influx into the Abbotsford community. The mix within the church of Kanadier, Russlaender and Paraguayan Mennonites, often with very different mindsets, yet working together, attests to his ability to lead and unite a church. Ens, Anna Epp. The House of Heinrich: The Story of Heinrich Epp (1811-1863) of Rosenort, Molotschna and His Descendants. Winnipeg: Epp Book Committee, 1980. Lehn, Cornelia. Frontier Challenge: A Story of the Conference of Mennonites in British Columbia. Clearbrook, B.C. : Conference of Mennonites in British Columbia, 1990. Loewen, D. Living Stones: a History of West Abbotsford Mennonite Church 1936-1986. Abbotsford, BC: West Abbotsford Mennonite Church, 1987. Peters, Gerhard I. Remember Our Leaders: Conference of Mennonites in Canada 1902-1977. Clearbrook, BC: The Mennonite Historical Society of British Columbia, 1982. Sawatzky, Linda Epp. Side by Side: A Memoir of Parents, Anna Enns & Heinrich M. Epp. Winnipeg, MB: Eppisode Publishing, 2010. Archival material held by Anna Ens (daughter), Winnipeg, due to be transferred to the Mennonite Heritage Centre, Winnipeg. Ens, Alvin G. and Richard D. Thiessen. "Epp, Heinrich M. (1904-1958)." Global Anabaptist Mennonite Encyclopedia Online. April 2005. Web. 24 Apr 2019. http://gameo.org/index.php?title=Epp,_Heinrich_M._(1904-1958)&oldid=138833. Ens, Alvin G. and Richard D. Thiessen. (April 2005). Epp, Heinrich M. (1904-1958). Global Anabaptist Mennonite Encyclopedia Online. Retrieved 24 April 2019, from http://gameo.org/index.php?title=Epp,_Heinrich_M._(1904-1958)&oldid=138833.